200 Venezuelans are leaving the country every day on foot. They deserve a humane, coordinated response. Six-year-old Camila placed the pouch of chocolate milk she was carrying on top of her pink and purple Princess backpack and smiled at the camera, oblivious of the tragedy that surrounded her. We were standing on the side of the road that connects Cúcuta, the largest border town in Colombia just a bridge away from Venezuela, with the interior of Colombia, as I interviewed Rosa, Camila's mother. Rosa told me that she had left her hometown in Venezuela because she could not afford enough food to feed her family or medicines to treat her daughter's kidney stones. So they traveled through Venezuela by bus for hours and crossed the border into Colombia, heading for Medell'n, where Camila's father was waiting for them. But without legal papers to stay in Colombia, they were unable to purchase a bus ticket and decided to walk to a town from which they would travel to Medell'n. The hike through the hills, including areas with freezing temperatures, takes more than 47 hours on foot. Camila and Rosa, whose real names I haven't used for their protection, are among the more than 200 Venezuelans who set out on foot from the border each day to try to reach a destination either in Colombia or elsewhere in the region. A survey conducted in July by the United Nations Office for the Coordination of Humanitarian Affairs found that the Venezuelans who leave here on foot are walking an average of 16 hours per day and expected to walk for about 13 days. Some, like Rosa and Camila, walk because they have no papers. Many others cannot afford a bus ticket. Most, unlike Rosa, had left their children behind in Venezuela. Few had enough resources to cover their journeys, many were not getting enough to eat, and more than 90 percent were sleeping in the streets. We heard story after story describing these same problems. The Colombian Red Cross has set up tents on the side of the road, where an average of 80 Venezuelans a day stop to drink water, eat cookies, rest, and make phone calls, a volunteer told me. Other Venezuelans cross to Roraima state in Northern Brazil, where the United Nations High Commissioner for Refugees (UNHCR), in coordination with the Brazilian federal government, has set up 10 shelters that house more than 4,000 Venezuelans. In two of the shelters, hundreds of members of the Warao indigenous community sleep on colorful hammocks and get food to cook their own meals. In others, Venezuelans from all over the country get three meals per day and sleep in white tents or special refugee housing units -- an image that reminds one of refugee camps in other parts of the world and is unprecedented in Latin America. Many others, including entire families, are not so lucky. They’re sleeping on the streets, using public bathrooms with poor hygienic conditions, and eating at a church that gives out meals daily. Despite the dramatic conditions they’re facing, which some have told me are humiliating, every one of the dozens of Venezuelans I interviewed in these circumstances said they were better off abroad than in Venezuela. These Venezuelans are some of the most desperate faces of the massive exodus of Venezuelans who are fleeing a humanitarian crisis, a ruthless government crackdown, violent crime, and hyperinflation at home. President Nicolás Maduro inherited a country with absolute concentration of power from his predecessor, Hugo Chávez. Under Chávez, the Venezuelan government packed the Supreme Court with political supporters in 2004 and used its unchecked power to censor and punish critics. Maduro has maintained firm control over the judiciary and other state institutions, including the electoral apparatus, and has effectively eliminated the National Assembly -- Venezuela's legislative branch -- since the opposition won a majority of seats in December 2015, later replacing it with a body packed with his supporters. Today there are no independent institutions left in Venezuela to act as a check on executive power. Maduro knows this, and has abused his powers to crack down on dissent, brutalize peaceful protesters, turn a blind eye to the pressing humanitarian crisis, and move forward with presidential elections despite widespread concerns that they lacked guarantees to be free and fair. Over 2.3 million Venezuelans have left their country since 2014, according to the United Nations. Many others out of a population of 32 million have left without registering with government authorities abroad. Rosa worked at a shoe store back home, but her salary wasn’t enough to purchase adequate food for her child. She told me that many times she didn’t eat to be able to feed Camila. Her husband, a construction worker, left Venezuela months ago, and had just been able to wire her enough money for them to travel to the border. Colombia has received by far the largest number of Venezuelan immigrants worldwide, with over 1 million people arriving there from Venezuela since March 2017. The Colombian government has made enormous efforts to address an overwhelming situation, adopting measures to provide Venezuelans with legal status and access to urgent health care, and allowing Venezuelans to enroll their children in school. Other initiatives in coordination with UN agencies and local groups provide services including meals, vaccinations, and shelter. However, many Venezuelans in Colombia who have not registered with the government still have an irregular status and face an array of difficulties. Other South American governments have also adopted special rules to provide Venezuelans permits to stay. These permits have provided legal status to hundreds of thousands of Venezuelans, helping them rebuild their lives abroad. Recently, however, some of these governments have made it much harder to obtain these permits. Chile, Peru, and Ecuador announced they would require Venezuelans entering the country to present their passports. Although Peru and Ecuador partially backtracked, it is important to note that this is an insurmountable hurdle for many. It sometimes takes as long as two years to get a passport in Venezuela these days. Hundreds of thousands of Venezuelans remain in an irregular situation in the region, which severely undermines their ability to obtain a work permit, send their children to school, and get health care. This makes them more vulnerable to labor and sexual exploitation, and human trafficking, as well was less likely to report abuses. In some Caribbean islands, Venezuelans are being arrested arbitrarily and deported, or face xenophobic attacks. And after a violent attack by Brazilians accusing Venezuelans of being implicated in a crime in the border state of Roraima in August, hundreds of Venezuelans crossed back to Venezuela. In the United States, Venezuelans have become the leading nationality requesting asylum. There were more than 72,000 Venezuelan asylum seekers in the United States as of June. Responding to Venezuelan emigration has become a major challenge for governments in the region. While governments aren’t obligated to take in everyone, everyone should have the right under the 1951 international Refugee Convention to apply for asylum if they have a well-founded fear of being persecuted on racial, religious, political, or certain other grounds. In addition, 15 governments in the region have incorporated a broader definition of “refugee” included in a nonbinding document, the Cartagena Declaration, into their legal frameworks. Under this declaration, people fleeing "massive violation of human rights or other circumstances which have seriously disturbed public order" may also be considered refugees. 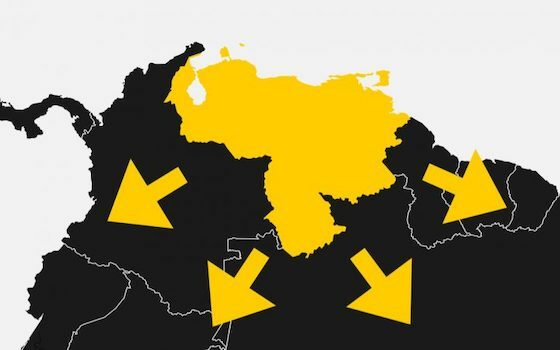 A Brazilian Supreme Court judge recently ruled that, by doing so, Brazil has a "duty of humanitarian protection" toward people fleeing Venezuela. There is no easy solution to deal with the Venezuelan exodus. But an approach that is consistent with human rights requires treating Venezuelan immigrants humanely, and it is critical to coordinate a regional response to do so. Governments should carefully consider the claims of all Venezuelans who apply for refugee status. They should also consider adopting legal pathways to offer legal status and protection to other Venezuelans fleeing the crisis, including the adoption of a region-wide temporary protection regime for Venezuelans. In addition, they should provide humanitarian assistance to Venezuelans who need it, and carry out awareness campaigns to fight discrimination and xenophobia. As long as the Maduro government pursues abusive policies, Venezuelans will continue to flee, and Venezuelan walkers will continue walking, with or without help. Other governments should ensure that they can do so safely, and continue to press the Venezuelan government to address the crisis that is generating the exodus. I left Rosa and Camila at a Red Cross tent, eating some candy and resting before moving on with their journey. The image of Rosa walking behind Camila on the narrow side of the road by a cliff, holding her daughter's backpack and telling her to be careful, remains in my mind. This article is republished from Foreign Policy in Focus under a Creative Commons license. Latin America: "The Venezuelan Walkers"